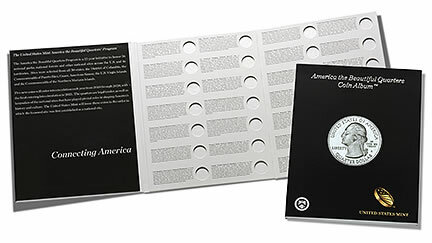 The United States Mint on Tuesday at noon ET began selling albums for America the Beautiful Quarters®. The Mint price for one is $9.95. The America the Beautiful Quarters Program honors national parks and sites throughout the United States and its territories. The program debuted in 2010 with the first five quarters, and it will continue through to 2021 with a final release, bringing the total amount of coins issued to fifty-six. The album is designed to store each of the quarters. "The sturdy album contains interesting facts and information about each national site next to a place holder for each quarter," describes the Mint’s online page for the product. "This album is an excellent way to store and showcase your quarter collection. The album can be purchased directly from the United States Mint online catalog at http://www.usmint.gov/catalog or by calling the Mint directly at 1-800-USA-MINT (872-6468). The only other albums offered by the United States Mint are for the Presidential $1 coins. The Mint continues to offer two of them — volume one for the first two years of dollars issued in 2007 and 2008 and volume two for those released in 2009 and 2010. In February, the Mint indicated that it had discontinued future volumes. While not stating exactly why the product series was halted, a lack of interest in them seems to be the reason. "The custom-designed album was intended to be released in multiple volumes throughout the life of the Presidential $1 Coin Program," the Mint stated in its discontinuation notice. "While Volume One was popular, sales of Volume Two dropped substantially… Subsequent volumes of the album (2011-2012 and beyond) will not be produced." Since one of the new quarter albums will hold all fifty-six America the Beautiful Quarters to be released, multiple volumes were not needed. That makes the product more viable. Additionally, collecting quarters is more popular. They are more readily found in circulating change, making them easier to collect than the difficult to discover Presidential $1 coins. Disagree with the comment that ATB quarters are readily available in pocket change. Not so in the midwest, not a single one has come through any routine transactions I have had. Can’t help but wonder if the cancellation of the president dollar series albums is because the mint already knows the program is ending prematurely (see the previous post regarding the glut of coins and the legislation introduced in Congress)? As more support for this premis, note that on 7-22-11 the mint stopped distribution of presidential dollars thru the direct ship program. While they said on their website it was because of credit card mileage point fraud, there haven’t been any offerings under the revised system yet this week. The handwriting seems to be on the wall. I’d have to agree with Boz in that the ATB quarters are hard to find. Just look at the mintage numbers though, pretty low. I am on the east coast here in New Hampshire and have a keen eye out for these in circulation, but I have only found one ever and it was grand canyon. I made the cashier check for more and there weren’t any. Another thing I have yet to find and search relentlessly in my change for is the 2009 dime. Agree with Josh. Western New York State. Have only gotten 2-3 ATB quarters in change in two years. Of course, yet to see any Territory quarters, either (or 2009 dimes or nickels). Would be nice if these would hold the P, D, and S Versions. Just My Opinion…. The photo only shows 28 coin slots. Are there another 28 slots not shown? Is the album holding 28 P and 28 D America the Beautiful Quarters or are there 56 quarters and I need two albums. Very confusing marketing. If there are 56 slots why not a photo showing all slots.